These posters provide some samples of the work promoted on this website. 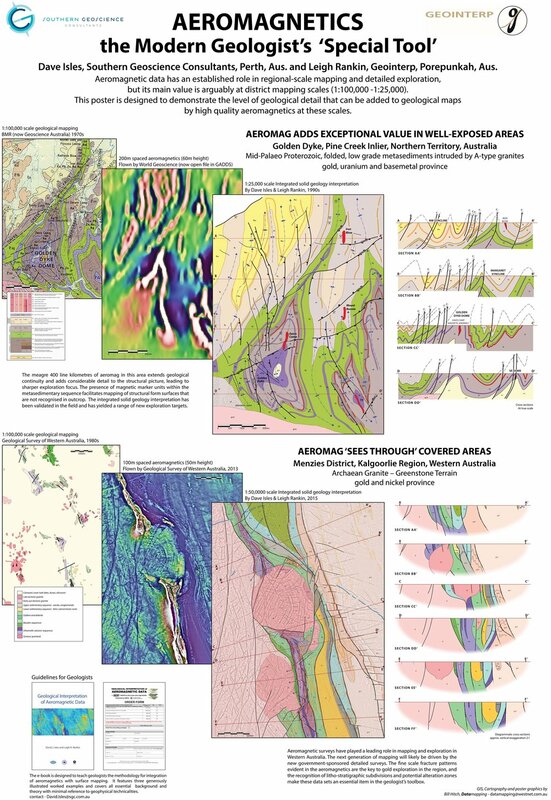 Illustrates the integration of detailed geological mapping with aeromag at scales of 1:25,000 (Pine Creek Inlier, Northern Territory) and 1:50,000 (Comet Vale-Goongarrie district, Western Australia). Both are current areas of mineral exploration activity. Click the download button below to access a full resolution PDF version of the poster. Outlines the Southern Geoscience approach to project integration and interpretation. The example used is the Turner Syncline, host to the Mt Tom Price iron ore deposits in the Hamersley Basin. Provides details of the 55,000 sq kms of mapping coverage completed by Jack Hallberg from 1976 to 2006, much of which is now available in full GIS format.